Last week I shared my recipe for Her Ladyship's Cranberry-Orange Muffins. 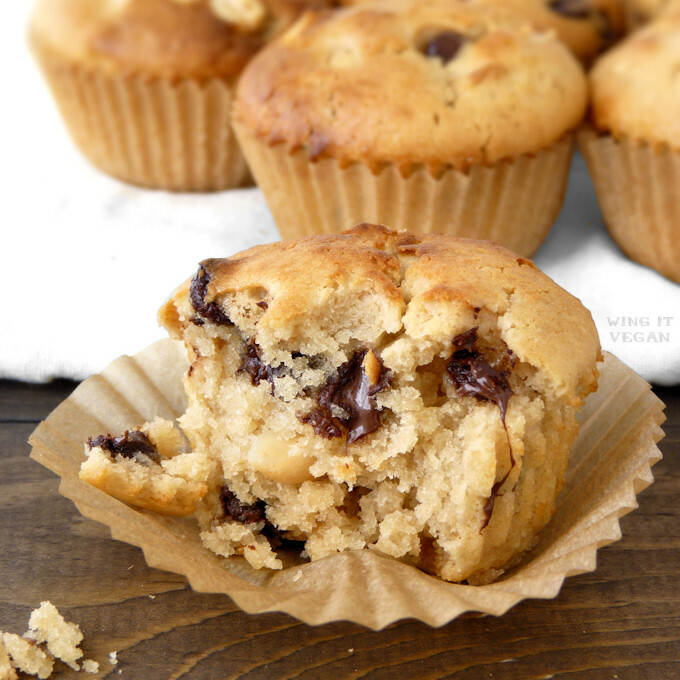 Today I'm sharing one for my kind of muffin. Raise your hand if you're a peanut butter lover! Yeah! I have to actively keep myself from blogging exclusively about peanut butter and chocolate, otherwise my recipe index would be pretty monotonous. I could totally do that. But then I'd have to change the name of my blog to Wing It Peanut Butter and Chocolate, or Wing It PBC, or Wing It PeaBuCho. Peabucho! I like it. I'll think about it. Can I interest you in a Peabucho Muffin? 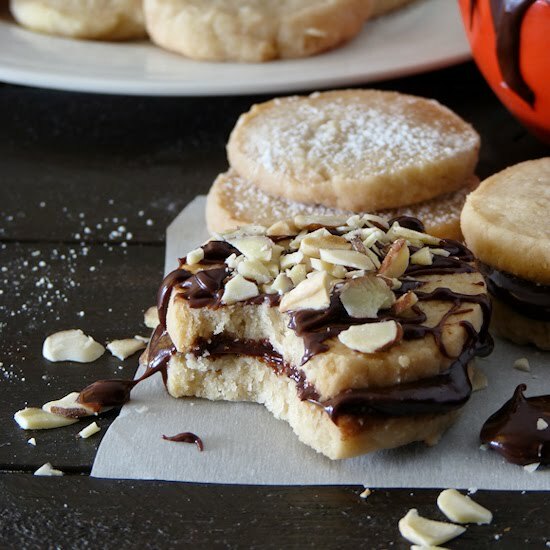 These are loaded with peanut butter, which makes them very dense and, well, peanut buttery. There is always the option to cut the peanut butter in half, which will render a lighter muffin that is still peanut buttery but at a more normal level. If you have a normal relationship with peanut butter, maybe the variation would be best for you. If your relationship with peanut butter is more intense, let's say if peanut butter is the "Mother" to your Norman Bates, then you may prefer the original version. Mr. Wing-It says he likes his muffins stupid, so he prefers the dense ones too. Zing! Preheat the oven to 375 degrees F (190 C), line a muffin tin with six paper liners and spray with cooking spray. In a small mixing bowl, whisk together the milk, oil, vanilla extract, and sugar. Add the peanut butter and whisk or stir until smooth. In a medium sized mixing bowl sift in the flour, add the baking powder, salt, and chocolate chips and stir well. Pour the liquid ingredients on top of the dry and gently stir until just combined. Your batter should be thick, but you should still be able to pour it out of the bowl using a spoon for guidance. If your batter is not at least a little pourable add a bit extra milk. Fill each muffin well almost to the top. If you want, you can throw a few extra peanuts and chocolate chips on top for decoration. Bake for 22 to 25 minutes or until a toothpick inserted in the center of a muffin comes out with just a few moist crumbs. I like to broil mine at 375 for two minutes to make the tops nice and toasty. So I bake mine for about 22 minutes and then broil for a couple extra minutes. Let them cool in the muffin tin for about 10 minutes before transferring them to a cooling rack. You can use only 1/4 cup of peanut butter if you want a fluffier muffin. 1/2 cup of peanut butter is for insane peanut butter lovers! I like to throw in 1/2 cup of chocolate chips because I have no self control, but I realize that it may be too much for strange people who are not addicted to chocolate. Did you choose the dense muffins or the fluffy variation? Either way, here's something else that's fluffy and sometimes a little bit dense. Lovey and Dovey! Here they are waiting for Food Dude to deliver their breakfast. Any time now. No hurry. We'll just be here looking hungry and miserable. Thanks. Love the zinger :D OH MY PEANUT BUTTER GOODNESS. Hehe - you can always count on us for bad puns and silly zingers! Aren't doves adorable? 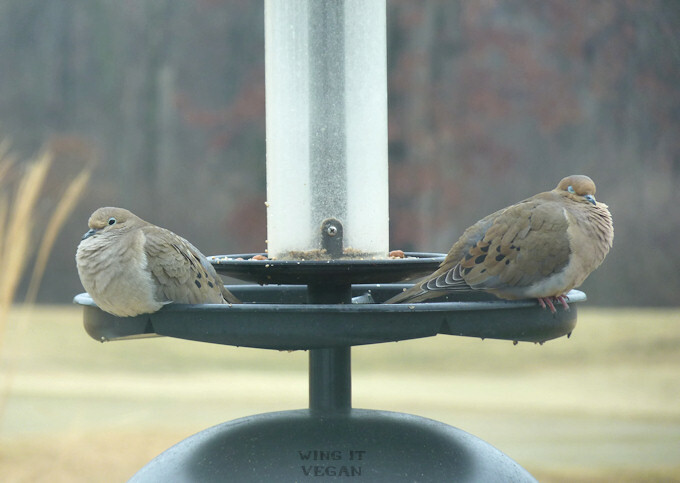 They are pretty much the only birds that get along with everyone, at least in our back yard. They just want to eat and chillax. I just made these. Why do I have to wait for them to cool? Cruel world. Nom nom nom nom nom nom nom. I would like to make variations of these, replacing the chocolate chips (hear me out!). One with blueberries and cinnamon (because PB and blueberries are actually awesome together), and one with chopped dried apple and butterscotch chips (for bake sales, people love butterscotch). That's impressive! I may break into your freezer and steal the last three. But then I'll blame it on Sahara. Bad kitteh! Yes to variations! Everybody loves butterscotch, right? I've met fellow raisin haters, a few nut haters, even one chocolate hater, but I've never meat a butterscotch hater. Maybe there's no such thing as a butterscotch hater! I will always be a boring berry girl, but butterscotch is fun. And when it comes to vegan bake sales anything that is butterscotch is always popular! Nice! Hoard all the butterscotch chips! Nothing wrong with being a boring berry girl. I'm a boring chocolate chip girl and it's hard to branch out sometimes. We like what we like! Nothing beats a classic peanut butter and chocolate chip muffin, in fact, I think it has to be one of my favourite muffin flavours ever. Wish I had one of these now! Oh gawd, these look amazing. I wish I had an oven! I feel for you, Jojo! 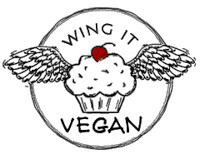 When Mr. Wing-It and I are traveling I always miss my oven so much! My boyfriend and I LOVED these! Perfect peanut buttery taste. If I double the recipe, would it still come out okay? Any changes I should be aware of? Do you think I could do a jam swirl in these? Or stick a spoonful of jam in the middle of each muffin before baking? OMG! Just woke up with a hankering for muffins and had everything except eggs. A quick Google search led me to the promised land of peanut buttery goodness! These muffins are AMAZING, hands down. So nice to have a half batch as well because I'm the only one eating for today. It's hard to find recipes for singles. Thank you!!! Ps- Do you have any nutritional stats on these? I'm not sure about the nutritional stats. Sorry about that. I imagine they can't be too low in fat with all that yummy peanut butter in them! I will be back, I've bookmarked you and am already prepping to make the quinoa lasagna bowl. Thanks! I must make these ASAP! I love that the recipe makes a half batch- perfect for my two roommates and myself. If halving the PB (I'm almost out) should I replace that other 1/4 cup with anything or just leave it out? Banana, maybe? Thanks! These are AMAZING! I generally bake in half batches,so this recipe is perfect. I made these for my dog, Dandelion's 1st birthday today! I know she will love them as will we. :) I left out the chocolate and extra nuts and decided to go with half the pb. I made mini cupcakes and then did one in the microwave with the left over batter. I added mini chocolate chips to the middle and top of that one. I was trying to save it for my sweetie, but I may have taken a few bites, lol! These are seriously delicious and a definite keeper. Thanks so much!